From Day to Day: Young Scholar’s Calendar and Encyclopedia the newest publication, is a rediscovered treasure, now in a revised and expanded version. It includes a Hebrew translation of the original English calendar, and encyclopedia for the young scholar’s. This bilingual edition is a collection of Torah teachings infused with the warmth of Chassidus, which contains lessons and quotations from Chumash, Prophets, Holy Writings, Midrash and Poskim, with a universal appeal for both young and old. Its clear and simple style together with its rich content will appeal to young and old and will prove to be an invaluable resource for parents, teachers and counselors. This publication has the distinction of having been authored by the Lubavitcher Rebbe specifically for children, including his introduction to each of the two volumes. 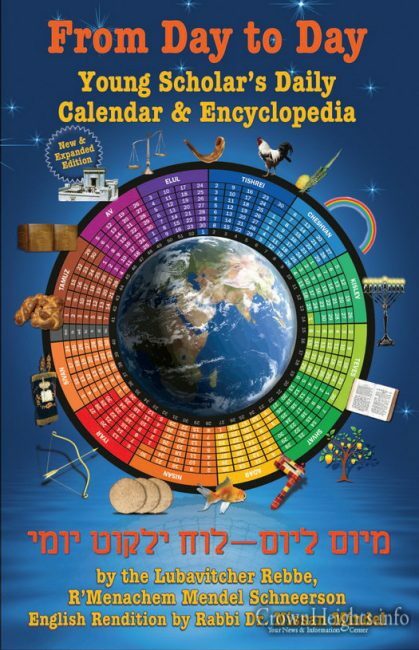 The calendar for year 5703, and Encyclopedia for year 5704. FROM DAY TO DAY – daily Torah thoughts by the Rebbe is going on sale for $13 starting on the 10th Adar II, at Judaica World of Crown Heights 329 Kingston Ave.